The first book in the series, Tales of the Stone Monkey: Connections gets the ball rolling by helping children develop confidence and self-esteem. Connections is an inspirational tale full of humour, insight and courage to help children learn how to take those first steps towards becoming the best they truly can be. Youngsters will be fascinated as they follow the amazing experiences of Gemma and Emma and their incredible new friends. The two sisters set out on an extraordinary adventure and as their tale unfolds they learn about the connectivity of life, how to conquer their fear, how to use their thoughts and how to develop compassion. 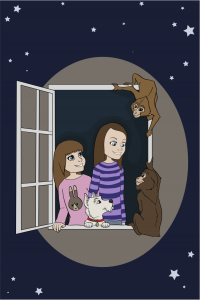 The story starts when Gemma is convinced she sees a stone monkey move outside a neighbour’s house. No one else witnessed it but later that night events take a bizarre turn and prove her right. Matters become really exciting as the girls contemplate embracing a new way of thinking and looking at life. Mango the monkey with his mate, Magenta and friends, Winnie the Westie and Strix the tawny owl, form a band of guardians responsible for caring for the girls and awakening their minds to a wider vision. Gently and calmly but with constant strong and loving support, they show the excited girls an alternative view of the world. Lessons prove not to be the normal classroom kind, however, as the team takes to the rooftops for their first task. The girls learn that we all possess special powers but few of us ever realise we have such capabilities. Courageously embracing all they are asked to do, the girls enthusiastically take their new knowledge further the next day by applying it to their daily life.